Paul's early musical love was for the club, rapping and DJ sounds of the 80s and 90s. He soon became an accomplished DJ himself. After seeing the Oliver Stone film "The Doors", Paul took an immediate interest in that group, and soon became an avid fan. It was only natural that he follow in the path of Jim Morrison - devising poems and lyrics of a mystical nature. When the vocalist slot for The Earthmovers became vacant, Paul approached the group with a view to writing the lyrics for another person to sing. It soon became clear that Paul was perfectly capable of singing them himself. His vocal style has been compared to Jim Morrison's. In partnership with Pete Jones, Paul has written most of The Earthmovers' material. After being introduced to the wider world of Progressive music, Paul's compositions expanded in style and scope - resulting in the mind-bending weirdness of The Ghost & Serpent Syzygy, Touch of Wild and more recently The House. When The Earthies went on hiatus in 1997, Paul re-applied himself to the world of dance music - now a huge movement in Europe, with the latest Trance and Drum'n'Bass styles. He secured a successful Saturday-night DJ residency at The James Brindley in Birmingham. John is the longest-serving Earthmover. He has played Bass for over 20 years (on and off), citing the likes of Geddy Lee and Chris Squire as his inspirations for picking up the instrument. Actually, the real reason he started on bass was that it only had four strings, and therefore was much quicker to learn in order to get into a band! His favourite instrument is his beloved Claret Rickenbacker 4001, but he also plays Bouzouki (notably on The Ghost & Serpent Syzygy), fretless Fender bass, guitar and Mandolin (badly!). After going through the usual short-lived, un-named college bands, he managed to avoid joining a group until 1987, when he fell in with a local group of ever-changing name and line-up. This eventually stabilised as Cold Flame: a trio of John, Kevin Reihill (guitar/vox) and Tariq Quattri (drums & guitar). This promising Purple-esque outfit only managed one gig (at the ill-fated Alum Rock) before financial pressures forced an end to matters. By this time, Cold Flame were sharing a lock-up rehearsal room at Robanna's with a group of John's friends, who played under the name Dusk. Some time before, their bassist Happy (see below) had left, so John was already filling in with them. Dusk had enormous potential, but suffered from emotional turmoil and continual line-up changes. This instability was exasperated by the lead singer's long-term battle with ME (which led to an earlier incarnation of the band being featured in a television documentary), which forced her absence for several months. One early gig was a unique affair - featuring a troupe of actors known as "The Lemmings Theatre" (John's brother Lewis among them) performing mimes to the songs! Frustratingly, there was little to show for John's time with the band - just a few rehearsal tapes and a half-finished 4-track demo. No gigs happened during this time. After a couple of years of doing little musically. John joined The Earthmovers (then nameless) after being recommended by friend (and fellow former Dusk-er) Matt Phipps-Hunt. John took an immediate liking to the feel-good atmosphere of the group, and threw in with them. John's contribution to the writing has been minimal so far - albeit including the gargantuan The Gulf Between Us. However, he enjoys arranging the raw ideas of Pete, Alan and Paul (notably the bass intro and rhythmic feel of Enough! and Free, Free, Free). After The Earthmovers went on ice, John played for a long time in local "Gothic Country" trio "Randolph Flagg". Visit www.randolphflagg.com to find out more. More recently, John has joined Dave "Doug" Sutheran's re-formed Dusk line-up. Visit www.theduskproject.co.uk for more info. John lives in Cofton Hackett (near Birmingham) with artistic collaborator Julie Hatton, their cats and a growing collection of vintage computers. The Earthmovers was Dave's first gigging band, but even at his debut, Dave demonstrated a cool head and pulled off a flawless performance. Influenced mostly by Dave Gilmour and Mark Knoppfler, Dave's clean and precise guitar style was a radical departure from those of his predecessors. However, he soon adapted to the Earthmovers way of doing things - steaming into rockers like Psychy Pink as though he'd been born playing them. Dave proved invaluable at providing striking and unusual guitar parts for the new, weirder songs that Paul created - such as The Secret Garden - taking the group into strange, uncharted territories. During the present hiatus, Dave has discovered a passion for the classic metal bands (particularly AC/DC and Black Sabbath). This will undoubtedly have a big impact on the group's sound when they return to the stage! Simon joined in 1993, shortly after Doug left. His easy-going manner fitted perfectly with the rest of the group. With a keen interest in funk and jazz styles, Simon's ambitious pallette of drumming styles (although a bit shaky for the first few gigs) easily grew to fill the void left by Doug. Not content with that, Simon has also taken up vocals, guitar and harmonica. 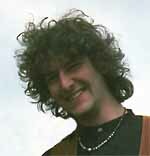 After several years with the band, Simon left to pursue a session career and play in a group based in Buxton. This led in turn to his collaboration with Rob Brunt in the Bromsgrove-based Country Rock outfit Randolph Flagg. 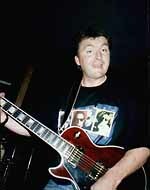 Simon stays in contact with both John and Paul, and has played at two reunion gigs. Simon is now living in Wales, and playing in. . . a Samba band? Ashley joined in May 1995, following Pete's departure. As another easygoing, Les Paul playing left-hander, he was the perfect replacement. Ashley's influences included Queen, Van Halen and Thin Lizzy - an interesting blend of styles which he put to full use in his guitar parts. He has a good ear for arrangements, and added some interesting touches to the established songs - taking the group further into Progressive Rock territory. Ashley left the group due to the usual musical differences, but remains in contact. His current project is a band playing classic British rock covers. The mainstay of the first two incarnations of The Earthmovers, Pete was a good-natured rock of stability in an otherwise erratic and illogical world. His easy, laid-back guitar style was reflected in his outlook on life. For several years, Pete was the glue that held the Earthmovers together. Hailing from Bedford, Pete came to Birmingham to work as an engineer at Lucas. There, he met up with Alan Liddle and Dave McFarlane. Discovering that they shared similar musical tastes, they decided to form a band. Practicing was easy at first, as they shared a house in Sparkhill. Pete and Alan wrote shedloads of material in the first few months - all with deceptively complex guitar parts (which sounded simple on first listening, but had strange rhythmic twists). When Alan left and Paul took over as singer, most of Pete's tunes were immediately re-worked with lyrics from Paul's back-catalogue of poems. This worked surprisingly well, and meant that the new group had a full set ready to play in only a couple of weeks. 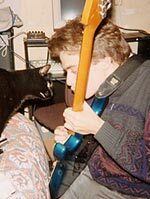 Pete continued to supply Paul with amazingly addictive riffs and ideas for the remainder of his time in the group. 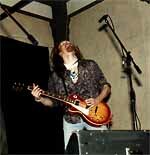 His guitar sound was fluid and uplifting - using a cocktail of effects on his Zoom box to give a strange, manic edge. This was used to full effect on The Gulf Between Us - where Pete's guitar did a damn good impersonation of a helicopter coming in, and The Ghost & Serpent Syzygy - where Pete served up thick, Iommi-style riffs as a carpet for the Bouzouki part to ride on. Nobody who came after has ever been able to capture the effect. When Pete got a job offer down South, it could have meant the end of the group, as he was such a major part of it. Ever the professional, Pete worked hard getting his guitar parts recorded on tape and paper to help out whosoever followed. Pete recently got back in touch with the rest of the band, and was a driving force behind the most recent Earthmovers reunion. 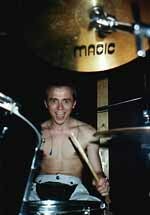 A veteran of the local pub rock scene, Doug was an accomplished drummer and song-writer, who was highly sought-after in the late 80s. With a keen interest in all forms of music (but especially Frank Zappa! 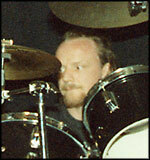 ), Doug's drumming style was solid, tight and yet fully expressive - with touches of Peart, Paice and Bruford. A founder-member of Dusk, Doug took a a major role in that group's song-writing and arrangements - including the superb narrative The Dance of the Marionette (AKA Sally), a dark modern-day fairy tale of murder, mind control and . . . er, puppetry! When orignal drummer Becky left The Earthmovers to take a job in London, John had no hesitation in asking Doug to take up the drumming role. Shortly after the first, ramshackle gig at The Greet with Paul, Doug decided to leave, for various reasons. His next project was as lead vocalist with "The Underdogs". See Doug's own site www.djsmusic.co.uk for more info. Doug recently re-established contact (through this site - ahh, the power of the web!). After a long time away from the music scene, he's currently involved with several projects, including a new incarnation of Dusk. Check out the News page for more info. 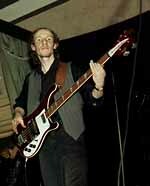 Another veteran of the local music scene, Mark previously played bass with Dusk (and many other groups). He asked to join on rhythm guitar at the same time that Doug was recruited. This gave the group an unbelievably tight rhythm section (now composed entirely of ex-Dusk members), which fuelled the song-writing process for Alan, Pete and Paul. Happy is a songwriter in his own right, although none of his compositions ended up on The Earthmovers' set. Happy left at the same time as Doug. He is currently in the Alvechurch-based covers band Junction 11 - now also playing stand-up electric bass and didgeridoo! During the day, he's a horticulturist, with a penchant for carnivorus plants. 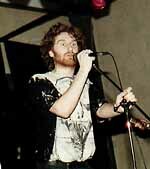 Not only a talented singer, Alan wrote the superbly-crafted poetic lyrics of the early Earthmovers songs. His vocal melodies were always exciting, never predictable. With a gift for imagination and wit, he was a natural frontman and performer - as entertaining off the stage as on. Like Pete, Alan worked as an engineer at Lucas. Unfortunately, a change of job meant that Alan had to leave the band and return to his native Scotland, breaking up what could have been the 90's finest song-writing partnership. Kevin's stay with the band was short but sweet - effortlessly taking over the drumming role from Simon, and forming a tight rythmn section with John. However, outside pressures meant Kevin had to bow out after only a couple of months. Kevin returned to help out with two of the reunion gigs - putting in superb performances at short notice. Another Lucas engineer! 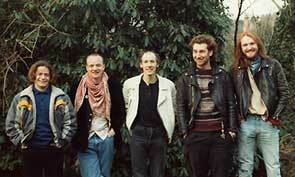 Dave formed The Earthmovers with Alan and Pete, taking the Rythmn Guitar role. Like Alan, he hails from Scotland, and returned there to take up a new job before he was able to play a gig. Best remembered for his coffin-shaped guitar case! A most unusual drummer: she also played orchestral bassoon. However, her Rock credentials were spot-on, with a satisfyingly heavy drum style. She had to leave shortly after the group formed, when her orchestral day-job required a move to London. More recently, she has taken to teaching and performing on a variety of instruments in the groups Tapatak and Zoox. You can find them both at http://www.tapatak.co.uk. 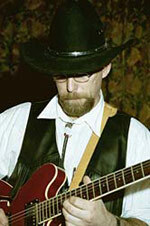 The founder of "Gothic Country" band Randolph Flagg (at one time featuring both Simon and John). 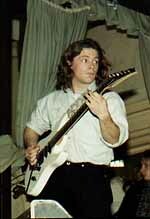 Rob has guested on guitar at three Earthmovers reunion gigs. With a solid grounding in both classic British rock and American country styles, Rob's guitar sound is a refreshing change from the shoe-gazing, garage band sound that prevails today. For more info on Rob's solo and Randolph Flagg music, go to www.randolphflagg.com. A former colleague of John's in the group Cold Flame (and others), Kevin has been a great friend and supporter of The Earthmovers for many years. During their heyday, he often guested as rhythm guitarist at gigs - allowing songs like The Gulf Between Us to achieve their full power. 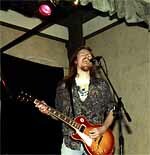 His own group "The Kevin Reihill Experience" has supported The Earthies at gigs. It was Kevin's synth piece that was used as the intro for Ghost & Serpent Syzygy, and he played a big part in the creation of some of the later songs - especially Secret Garden. 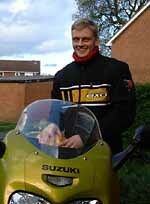 After working all over Europe for a telecoms company, Kevin briefly returned to the UK and made contact again in 2006, but has since gone to ground again. He could be anywhere in the world right now!